If you’ve lived in the South, you may know the custom of eating blackeyed peas or other legumes on New Year’s Day. The dish is served for luck and prosperity in the New Year. The tradition dates back to the Civil War, when Union troops confiscated crops and livestock, leaving the population with little to eat. What remained were legumes and greens, which kept the populace from starving. 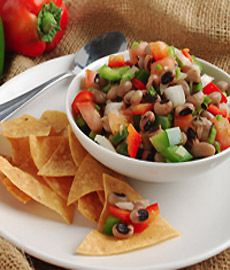 It’s easy to honor tradition, with this easy blackeyed pea salsa. The recipe is by chef Tom Fraker and provided by Melissas.com. If you’d like something heartier, try this blackeyed pea stew recipe. 1. In a large mixing bowl, combine all of the ingredients and gently mix to incorporate. 2. Serve with chips, beer, margaritas or your favorite beverage. Blackeyed peas (also spelled black-eyed) are medium-sized, ivory-colored beans with a large black coloration (the “eye”) on the inner curve of the beans, where they are attached to the pod. Related to the mung bean, blackeyed peas originated in Eastern Asia and were brought to the Americas with the African slave trade, and were a staple of many plantation diets. They remain best known as a Southern dish, where they are often served with ham and rice. Blackeyed peas have a sweet, mild flavor and firm texture, and absorb the flavors of a dish very well.